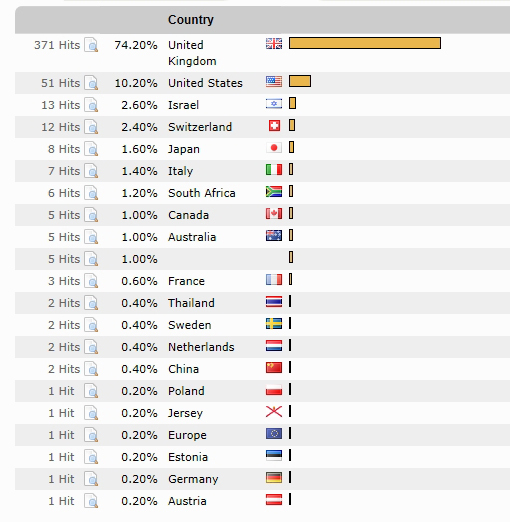 As always the majority of our hits are from within the UK, but there are numerous other countries checking in, including a significant total from the USA. 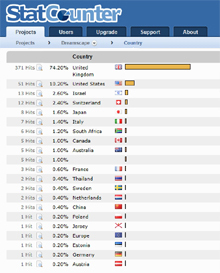 The last 500 visitors to www.toyah.net are from: United Kingdom (371), United States (51), South Africa (11), Finland (8), Canada (6), Netherlands (5), Italy (5), Ireland (5), Germany (5), Denmark (4), Australia (4), Estonia (3), Russian Federation (2), Korea (2), Spain (2), Luxembourg (1), France (1) and China (1). Interest is truly global and not strictly limited to the digital world. The latest fanzines were posted out to the UK, US, Australia, Norway, Ireland, Belgium, Finland, Germany, Netherlands, Estonia, Switzerland, Spain and France. Hey! 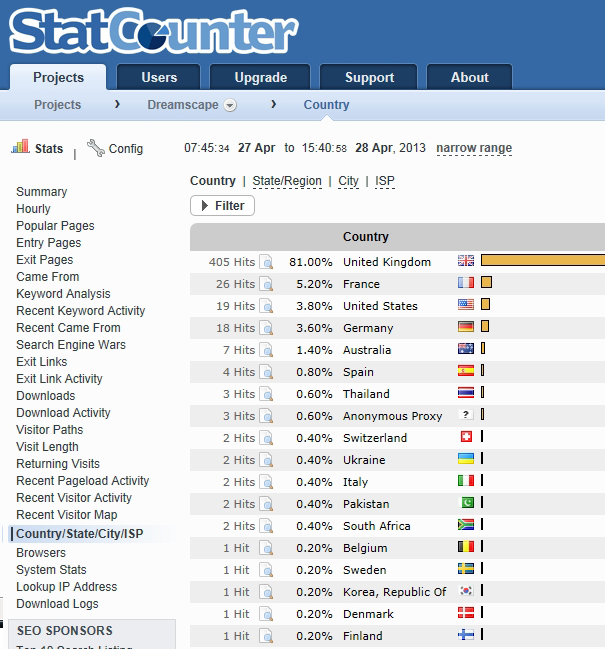 It’s Christmas, an ideal time to take one of our, very sporadic, looks at the visitor stats to this website. In these times of social media essentially becoming the internet for many people, this site is still very busy and continues to receive 100′s of unique visitors each and every day. Even on the quietest day of the last couple of months, which was Saturday 20th October, there were still 130 unique visitors. I have friends who run well-known Madonna, Doctor Who and U2 fansites and all say social media has seriously affected their visitor stats over recent years. 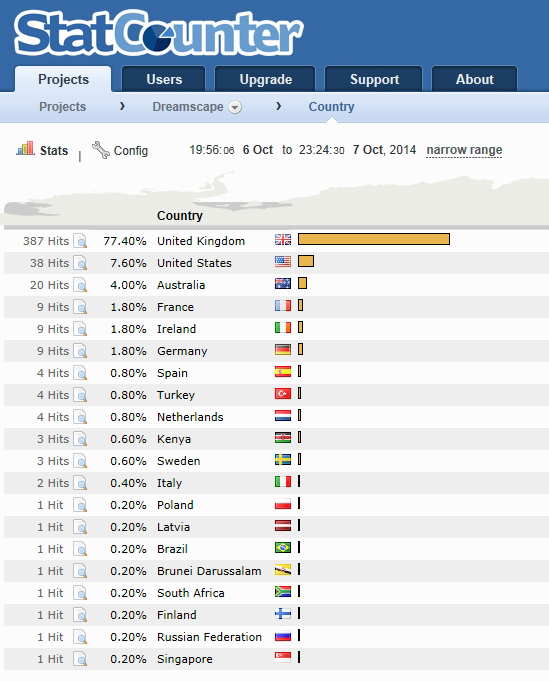 In the last 24 hours alone there have been visits to Dreamscape from: United Kingdom, United States, Israel, Switzerland, Japan, Italy, South Africa, Canada, Australia, France, Thailand, Sweden, Netherlands, China, Poland, Jersey, Estonia, Germany and Austria. View a larger version of the stats graphic here. I must confess, I haven’t looked at Dreamscape’s stats for a good while. Just been too busy with other things. I was pleasantly surprised when I checked the stats at Stat Counter tonight (just 20 minutes ago to be precise) – In these times of Facebook, social media and everything else but the kitchen sink, this site is still very busy and continues to receive 100′s of unique visitors each and every day. Even on the quietest day of the last couple of months, which was Sunday 14th September, there was still 190 unique visitors. In the last day alone there have been visits to Dreamscape from: UK, USA, Australia, France, Ireland, Germany, Turkey, Netherlands, Spain, Kenya, Sweden, Italy, Brazil, Brunei Darussalam, Finland. Russian Federation, Singapore, Poland and Latvia. 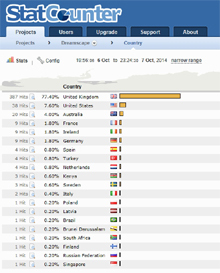 Interest in Toyah is truly global – View a larger version of the stats graphic here. 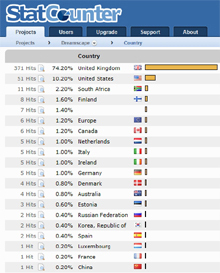 Something we haven’t done for a while… a look at which other places in the world people are visiting Dreamscape from. Toyah fans are all over the globe. 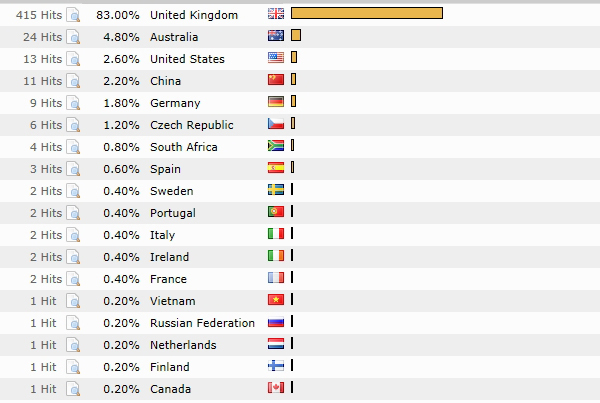 As always the majority of visits are from the UK, but as you can see, over the last 24 hours there have been visitors from France, USA, Germany, Australia, Spain and numerous other countries. This is just a snapshot of the last day or so, no doubt the list of locations will be quite different tomorrow or the next day! Hello to everyone out there! What was the last album you played? I’m currently listening to the playlist I put together a few months ago. • Click on the screenshot to view a larger version. 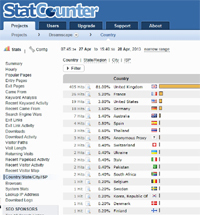 Previous stats updates are available to view here.